One attains the way of heaven. Here advance is checked just as in the third line of hexagram 9 the Taming Power of the Small. However, in the later the restraining force is slight; thus a conflict arises between the propulsive and the restraining movement, as a result of which the spokes fall out of the wagon wheels, while here the restraining force is absolutely superior; hence no struggle takes place. One submits and removes the axletrees from the wagon -in other words, contents himself with waiting. In this way energy accumulates for a vigorous advance later on. The Creative is tamed by Gen, Keeping Still. This produces great power, a situation in contrast to that of the ninth hexagram, Xiao Xu, the Taming Power of the Small, in which the Creative is tamed by the Gentle alone. There one weak line must tame five strong lines, but here four strong lines are restrained by two weak lines; in addition to a minister, there is a prince, and the restraining power therefore is afar stronger. The hexagram has a threefold meaning, expressing different aspects of the concept "Holding firm." Heaven within the mountain gives the idea of holding firm in the sense of holding together; the trigram Gen which holds the trigram Qian still, gives the idea of holding firm in the sense of holding back; the third idea is that of holding firm in the sense of caring for and nourishing. This last is suggested by the fact that a strong line at the top, which is the ruler of the hexagram, is honored and tended as a sage. The third of these meanings also attaches specifically to this strong line at the top, which represents the sage. When innocence is present, it is possible to tame. Hence there follows the Taming Power of the Great. Holding fast to heavenly virtue is the prerequisite for innocence. On the other hand, innocence is the indispensable condition for being able to hold fast to pristine heavenly virtue. The Taming Power of the Great depends on the time. 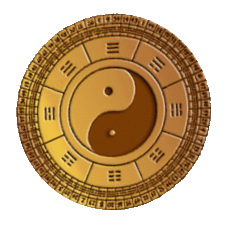 The movements of the two trigrams are toward each other. The Creative below presses powerfully upward, and Keeping Still above holds it fast. The nuclear trigrams Zhen and Dui also have a tendency to rise, the upper more so than the lower. These are the latent forces that are intensified by the holding fast. The two weak lines occupying the ruler’s and the minister’s place restrain the strong lines below, while showing recognition and liberality toward the strong line above. 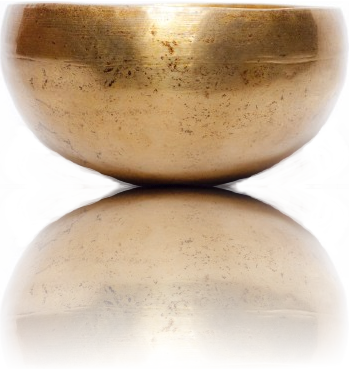 This hexagram is the inverse of the preceding one. To hold firmly to great creative powers and store them up, as set forth in this hexagram, there is need of a strong, clear-headed man who is honored by the ruler. 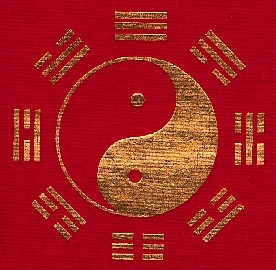 The trigram Qian points to strong creative power; Gen indicates firmness and truth. Both point to light and clarity and to the daily renewal of character. Only through such daily self-renewal can a man continue at the height of his powers. Force of habit helps to keep order in quiet times; but in periods when there is a great storing up of energy, everything depends on the power of the personality. However, since the worthy are honored, as in the case of the strong personality entrusted with leadership by the ruler, it is an advantage not to eat at home but rather to earn one's bread by entering upon public office. Such a man is in harmony with heaven; therefore even great and difficult undertakings, such as crossing the great water, succeed. The Taming Power of the Great. Firmness and strength. Genuineness and truth. Brilliance and light. Daily he renews his virtue. The firm ascends and honors the worthy. He is able to keep strength still; this is great correctness. It furthers one to cross the great water,” because one finds correspondence in heaven. The upper trigram Gen is firm, the lower, Qian, is strong; the upper is genuine, the lower is true: the upper is brilliant, the lower light. Thus the two trigrams complement each other. Through keeping still (Gen), the powers of character (Qian) are so strengthened that a daily renewal takes place. This refers to the effect of the personality. Here the first meaning of the hexagram is given — keeping still and collecting oneself. The firm element that ascends is the nine at the top. It, mounts above the six in the fifth place — the place of the ruler — and this ruler honors it in its ascent because it is worthy. The upper trigram Gen, Keeping Still, is able to hold fast the lower, Qian, the strong. This explains the words of the Judgment: “Perseverance furthers.” Here we have the second meaning of the hexagram: holding fast and keeping still. Not eating at home, that is, entering public service, brings good fortune, because the six in the fifth place represents a ruler who nourishes people of worth. This gives the third meaning—holding fast and nourishing. 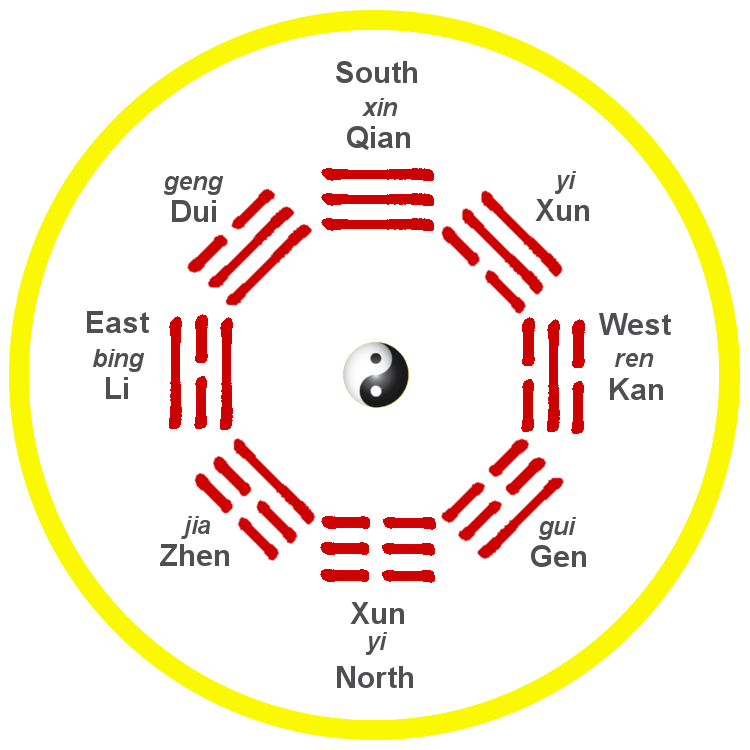 “It furthers one to cross the great water.” This idea is suggested by the two nuclear trigrams — Zhen, which also means wood, over Dui, lake. 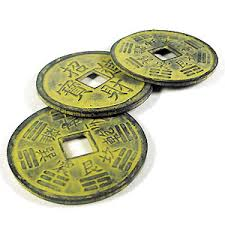 This dangerous action is possible because the ruler of the hexagram, the six in the fifth place, is in the relationship of correspondence to the nine in the second place, the central line of the lower trigram, heaven (Qian).